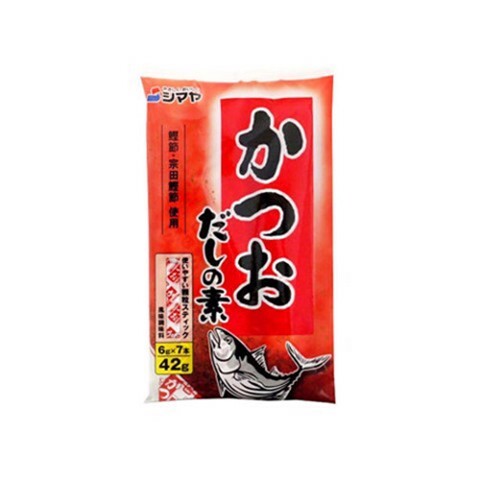 Give your Japanese cooking a natural umami boost easily with Shimaya's MSG free bonito dashi stock powder. This box contains ten sachets of instant dashi soup stock flavoured with bonito fish, as well as kombu kelp and shiitake mushroom, for an intense umami flavour without the need for any added salt or artificial flavours. Yeast Extract, Dextrin, Powdered Dried Bonito Fish Flakes, Sugar, Powdered Dried Bonito Fish Flake Extract (Dried Bonito Fish Flakes, Dextrin, Bonito Fish Extract, Yeast Extract), Powdered Bonito Fish Extract, Powdered Kombu Kelp Extract, Powdered Shiitake Mushroom Extract, Starch. Miso Soup: mix 1 sachet dashi with 600ml hot water, then add 2 tbsp miso paste for 4 servings of soup. Hot Noodle Soup: mix 1 sachet dashi with 1L hot water and approx. 50ml tsuyu soup base for 4 servings of soup.